Here are our top companies to look out for that we met at Paws in the Park. The majority of the companies at the event we had met or used before but these five were you fabulous new finds of the weekend. Hope you enjoy! Gerties and Berties – sell dog beds and towel wraps. G&B had to be our favourite discovery of the weekend. Their main product is their waterproof beds, they are unique in that they are more like human beds that dog beds. You buy a waterproof mattress with a removable cover so you can remove the dirty cover, put it in the wash and voila, clean bed! Due to the waterproof nature of the mattress you avoid the tendency of dog beds to get a little stinky over time! Their beds come on two different styles, donut beds and pillow beds and both styles come in three different sizes, there’s a bed for everyone. They also have a range of different covers for all their beds, our favourite is the multi coloured fleece (the big reddish one in the picture below) but there are loads of options to suit every home. The beds were super comfortable, we tested them all thoroughly and we even saw people sitting on them! Their beds are quite expensive, donut beds (with a cover) range from £63 to £118 and pillow beds range from £41 to £92, these beds are made to last so should be looked at as a long term investment. G&B’s also sell towel wraps, as modelled by me and Rhapsody in the photos below, which we think are an absolute bargain at £12-£19. Rhaps needed another towel coat and Mum thought that for £12 it was worth trying a new style and she was very pleased with the result! The small wrap fitted her perfectly. 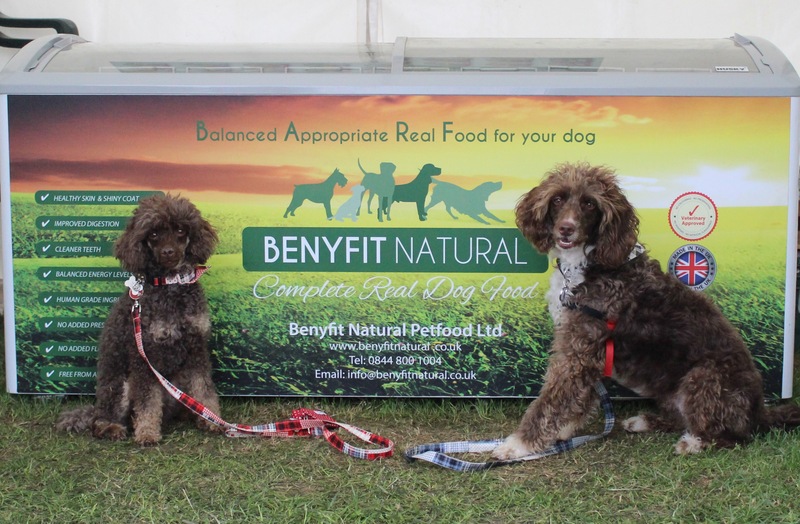 Benyfit Natural Food – sell high quality raw dog food. We were very excited to find Benyfit this weekend, many of you will know that we are raw fed and have been conducting ‘Raw Reviews’ for the last few months. We are always on the look out for great new companies to bring on board and we are thrilled to say we can add Benyfit to that list. The full review should be with you a in few weeks but so far we are seriously impressed. They sell a wide range of complete raw meals for adult dogs as well as their puppy and senior ranges and meaty bones and chunks. Prices start at just £3.45 per kg of mince, great value for such high quality mince. Their mince in chunky, their bones are very meaty and their prices are reasonable – what’s not to love?! Quarters of Sussex – sell custom dog houses (it feels wrong to call them kennels!). As you can see from the photos below, these are no ordinary dog houses. Run by husband and wife team, Gavin and Mimmi, each house is made by hand in, you guessed it, Sussex! The company is only a few weeks old but their houses are the product of Gavin’s years of experience in both building and engineering. The houses come in a number of styles; Hampton (the blue and white houses below), contemporary (natural wood house below) and they even have an indoor style. These gorgeous houses do not come cheap; indoor models start at £380 and outdoor at £450 but you can be safe in the knowledge that only the highest quality materials have been used and every house is bespoke to your personal requirements (there are over 50 colour options available! Quarters of Sussex use local materials where possible, they work with a local building firm to use materials that would otherwise have been wasted and gone unused, what a great idea! Duck Soup – sell many things but, for us pooches, or rather our assistants/personal trainers/chauffeurs, they sell a range of neoprene bags. These range in size from their large walking bags (RRP £40) which can carry all manner of dog paraphernalia, leads, balls, treats, water, even a picnic for the humans, should you be feeling generous, all the way down to their handy non-zip treat bags (Standard RRP £15, Premium RRP £18), the rubber slit opening makes them very easy to get treats out of (and to avoid spilling them), a very useful feature for those of us that participate in doggy activities such as agility, I’m sure you’ll agree. All of Duck Soup’s products are made of 4mm neoprene which is water-resistant, has thermal properties and can be machine washed, useful if your humans forget about the cheese they put in there! We don’t have time to tell you all the great products they have – head over to their website to check out all they have on offer. Skippers – sell fishy food and treats for dogs. Ok. We know we were late to the party on this one. We seem to be the only people at Paws in the Park that weren’t familiar with their products and now we know why! They sell an amazing array of fish based foods, both kibble and raw, and a great range of 100% fish treats and even some fishy biscuits. All their products are made using responsibly and ethically sourced fish from within the EU. We were lucky enough to get a fish skin twirl to try out and they were a big hit (see pictures below). They are made from 100% air dried fish skin twisted to make a fabulous dental treat. Our PA was supposed to take us back to buy some on the way back to the car but she forgot. We punished her appropriately. Skippers offer a wide range of treats from fish cubes to fish jerky in all kinds of shapes and size, from whole dried fish to fish fingers and they all looked, and smelt, delicious. We will definitely be getting treats from Skippers next time we see them, and our PA will not be allowed to play the “we’ll come back later card”! Hope you enjoyed our fabulous finds, our next event is Dog Fest in Windsor on the 25th/26th June, I’m sure we’ll have more fantastic companies to share with you after that weekend! Next > Top 10 Treats from our recent shows!